Long-term drought and aggressive seasonal wildfires have consumed property, lives, and farmland in the American West. The dry weather and blazes are battering regional economies and putting residents and agricultural businesses in several states on a path toward water restrictions. At least part of this story of water woes lies underground. The map above combines data from the satellites of the Gravity Recovery and Climate Experiment (GRACE) with other satellite and ground-based measurements to model the relative amount of water stored in underground aquifers in the continental United States. The wetness, or water content, is a depiction of the amount of groundwater on July 7, 2014, compared to the average from 1948 to 2009. Areas shown in blue have more abundant groundwater for this time of year than comparable weeks over the long-term, while shades of red depict deficits compared to this time of year. The maps are an experimental product used by the U.S. Drought Monitor and supported by NASA’s Goddard Space Flight Center. The measurements are derived from observations of small changes in Earth’s mass and its gravity field—features that are affected by the movement and storage of water and ice around the planet. 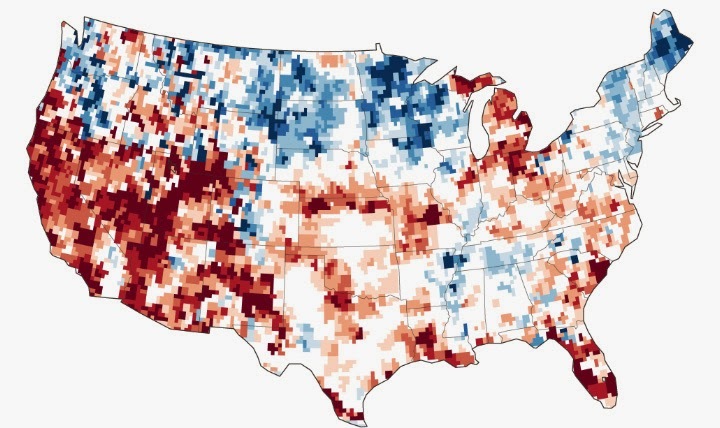 The extent of drought in the American Southwest are reflected well in the GRACE map. California, Nevada, New Mexico, Colorado, Texas, Arizona, Oklahoma, and Nebraska have been suffering from various degrees of long-term drought that has parched the land surface and prevented the replenishing of groundwater below. However, some other odd juxtapositions appear. The Pacific Northwest states of Oregon and Washington are suffering through raging wildfires, as months of hot weather have dried out forests. But according to the groundwater data, conditions underground are normal to wet—likely a reflection of the long lag between the accumulation and depletion of water underground and the changes in conditions on the surface. Those states had very wet winters, but the heat and dryness of spring and summer have not yet penetrated the underground storage. Maps by Chris Poulsen, National Drought Mitigation Center at the University of Nebraska-Lincoln, based on data from Matt Rodell, NASA Goddard Space Flight Center, and the GRACE science team. Caption by Mike Carlowicz. This KOA has well maintained facilities including a new bathhouse with individual full bathrooms and a pavilion for group events. The river runs very close to the camping areas and beautiful mountains run across both sides of the valley. Downtown Lava Hot Springs is a short walk from the KOA with water slides and hot pools. We enjoyed sitting in the pools and soaking in the pools. These hot springs are particularly enjoyable because there is no sulfur in the water and although there is naturally occurring chloride, the water is not chlorinated. See lavahotsprings.com for more information. The only potentially negative aspect of this KOA and downtown Lava Hot Springs is the train tracks across the highway from the camp area. During our most recent visit, several trains stopped there as late as 11:00 PM. So be prepared to hear quite a bit of racket as trains are breaking and accelerating. I didn't find these sounds to be unpleasant, but some may. I recently bought a new toy and filmed a few of the sites we saw during our summer vacation.